FWF's Deck Boat Celebrated and Christened by Michael C. Hartman, FWF Board Member and Young Professionals in Yachting after all their hard work and sponsorships to remanufacture the vessel to be fully wheelchair accessible! Thank you to all who contributed to this wonderful project and to Luke Brown Yachts for hosting this wonderful celebration at the Ft. Lauderdale International Boat Show. An explosion on the deck boat occurred in Oct. 2012. Tom Barrows, the owner was in the burn unit for 40 days. When he came out, he decided that it was time to get rid of the boat, so his daughter, Mary Jane Noon, of Luke Brown Yachts, decided to donate it to Freedom Waters Foundation. 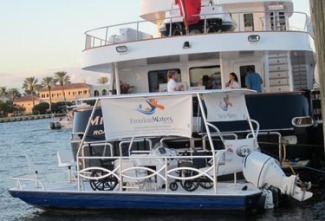 At the same time, Freedom Waters Foundation had been looking for a wheelchair accessible boat to utilize in Ft. Lauderdale in the FWF programs and did not have luck in locating one. So, the Young Professionals in Yachting, with the leadership of Michael Hartman, stripped the boat to just a deck and remanufactured it with 99% donated materials, equipment and skills to make it the most beautiful, fully accessible deck boat possible! 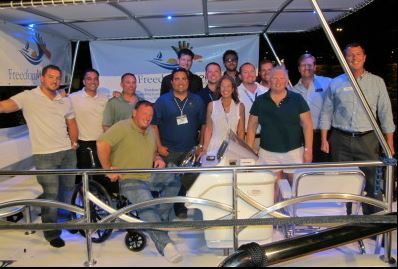 And, on Sunday, November 3, 2013, at the Ft. Lauderdale International Boat Show, the Freedom Waters Foundation's Deck Boat was celebrated and christened. Everyone is looking forward to many years of offering the opportunity to being on the water to those who may not otherwise have the experience and to making life long memories! Thank you to all the donors and sponsors.